This entry was tagged apartments, Bogotá, cars, city government, Colombia, community, development, economics, emotional appeal, environment, government mandates, green space, local government, minimum parking requirements, parking, transportation, urban housing, urban planning. Bookmark the permalink. Great job! Love the visual. I think it helps in the instance of parking and how much life pavement actually stifles. Perhaps the saddest thing I’ve seen out my window is a father who takes his crying son outside to get him to calm down. He just stands there cradling him in the parking lot because there is nowhere else to go. 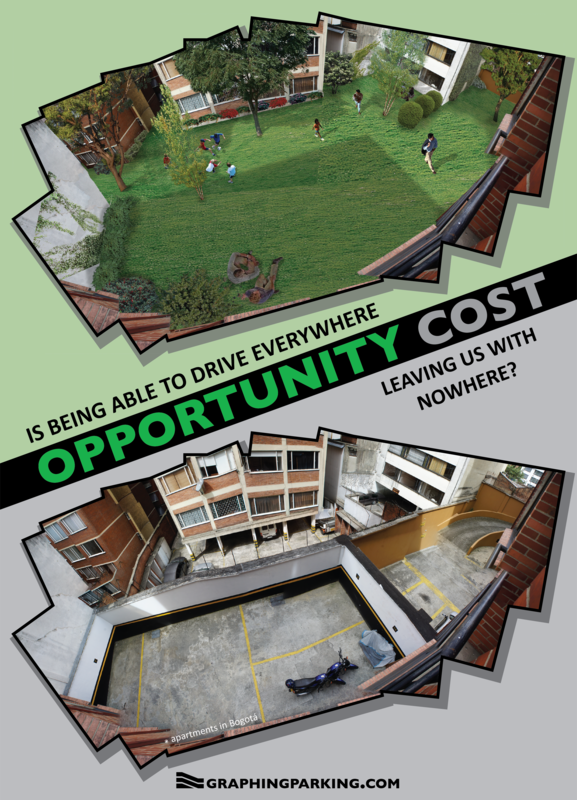 The complete lack of quality outdoor space has really prevented any kind of community forming. I think this mini parking crater can be at least partially faulted for some of the trust issues the the residents have with each other. I don’t know if you can see the electric fence or the jagged glass that tops the walls, but these are not protecting against some outside invader, but rather against neighbors. I guess there is kind of a chicken and egg situation. Even if the walls remained though, there could be some space for socializing between people in the same building. Yikes! Didn’t notice that before. It’s a sad irony that what was created to prevent safety creates isolation and perpetuates the negative it was trying to prevent. Always interesting to see others observations of the same sort of thing! Our Planning Commission desires to radically change our off street parking requirements. I am looking for suggestions about how to do this. We use the standard ratios for all types of uses. Do we waive the wand and go from requirements like 1space /200 sf to nothing? Or is there some other way to address this issue. Thank you for any insights that can be provided. It’s important to note that even if your parking minimums change overnight, your city won’t. Even if you repeal all minimums citywide, it will be many years before most buildings are built under the new rules, and many developments will still choose to include parking. The change on the ground will be slow even if the policy change is not. I personally would encourage full repeal of all parking minimums. That said, there are a number of incremental changes that can have a meaningful impact if full repeal is not politically feasible. Since parking minimums are meant to alleviate overcrowding of street parking, it could make sense to eliminate those minimums where other management strategies such as parking meters or permit parking are already in place. Expanding metered zones could provide revenue to improve alternatives like transit, bike, and pedestrian infrastructure. The revenue could also be used to provide public parking garages that serve a district rather than a single building. Another strategy could be to allow buildings with different uses that experience peak traffic at different times to share the same parking. Whenever there is a full parking lot close to an empty one, that is a missed opportunity for enhanced efficiency. One big problem with parking minimums is that they usually require all of the parking to be located on the same site as the building they serve. Allowing some flexibility to provide that parking off-site–and possibly in a shared lot–could be especially beneficial to smaller buildings on small lots where it is difficult to accommodate parking. I hope some of that is helpful to you. I’m sure you are already aware of Prof. Donald Shoup’s book The High Cost of Free Parking, but I wanted to point out that it contains numerous case studies from cities and towns that have reformed their parking in different ways.